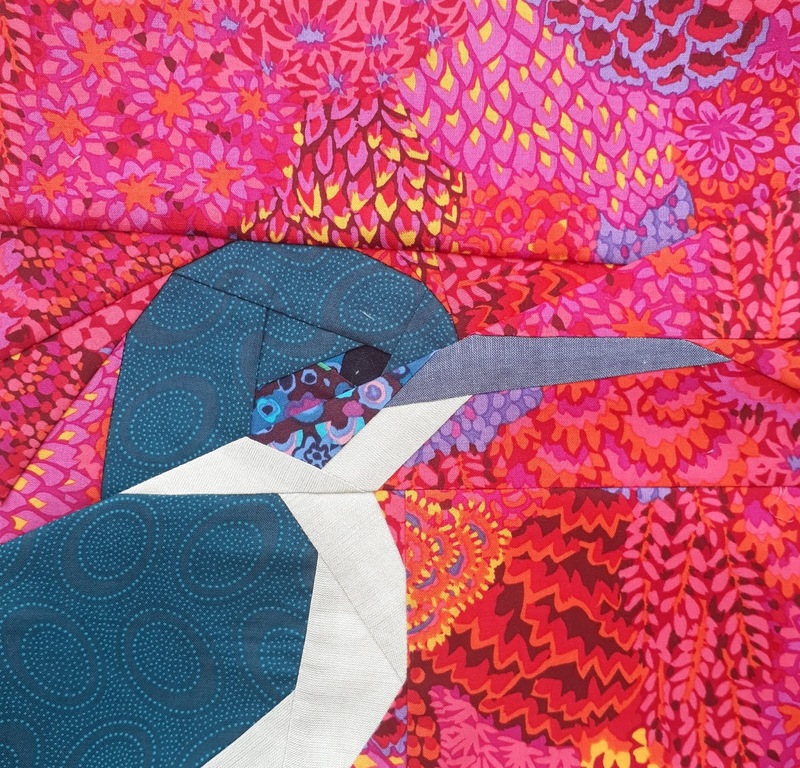 The first block of the quiltalong is the Kingfisher. This pattern is based on a kingfisher resting on a post that I had published in issue 18 of the Fat Quarterly Review a few years ago. Although I had good intentions, I never got around to releasing the pattern in it's own right, so I thought that this was a good opportunity to give it a bit of a facelift. I really focussed on keeping the pattern simple, but tried to ensure that it has enough detail so as not to be plain and boring. It was important to me to keep the pattern accessible for beginner paper piecers. 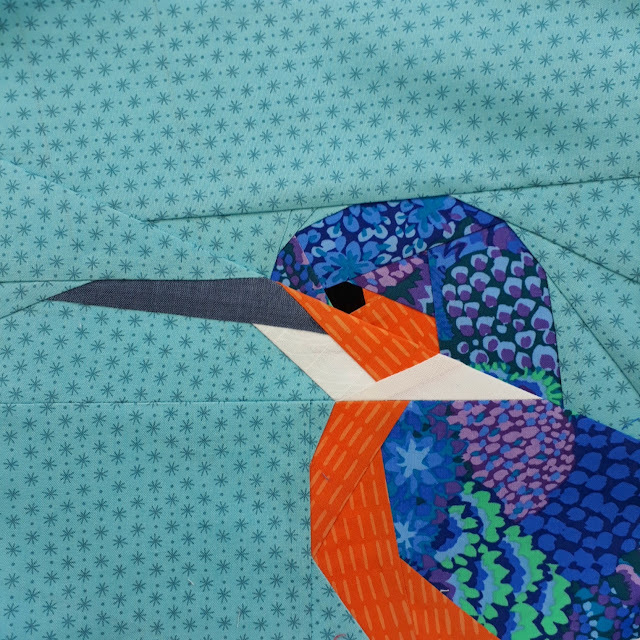 I am happy to say that I think that I succeeded in this as my 8 year old daughter has sewn a woodland quiltalong kingfisher. It took her three sessions (one session per paper foundation). Like most beginner paper-piecers she had a few moments of frustration, but in general she enjoyed the process. She is really proud of her work and is now trying to decide whether she wants to sew the hedgehog or the fawn next. The fun thing about kingfishers is that they come in different colours in different parts of the world. The kingfishers that are found in Scotland look like the kingfishers depicted above. Kingfishers in New Zealand can be identified as a streak of jade green flashing across the sky. I thought it would be fun to sew a version of the block which would represent this. Remember, it is absolutely not a problem if you want to adapt the colour scheme of your kingfisher to reflect birdlife in your part of the world. One of my pattern testers told me about black kingfishers that her husband had seen on his travels. Or even to create a fictional colourful kingfisher. In order to be in to win the first of the weekly prizes, you need to post your kingfisher block on instagram by 17th July. Don't forget to tag me @tartankiwi and to tag the quiltalong #woodlandqa2. Don't forget to check out the hashtag and comment on the other versions of the blocks that you see, maybe you will make some new instagram friends! This post provides information about the patterns, the prizes, the timescale and any other issues that you might be wondering about in relation to the quiltalong. Good luck, I can't wait to see what you all do with the pattern. All I can say is lucky I am on a small holiday because I think I have an addiction to making these cute critters!........and what about my poor Running Zebra? I never knew Kingfishers were different colours in different parts of the world.